Carl Philipp Gottlieb von Clausewitz (IPA: [ˈklaʊzəvɪts]) (July 1, 1780 in Burg bei Magdeburg  – November 16, 1831 in Breslau) was a Prussian general who fought in the Napoleonic Wars. He joined the Russian Army to fight against the French invasion of Russia. Later, he wrote about war and the military. He wrote the book On War, in which he said that "War is the continuation of politics by other means." In his book, On War, Clausewitz wrote how to win a war, how to build an army, and what war is. He did not think war was an art or a science. Instead, war was about people, money, and land. ↑ Christopher Bassford. (2002). Clausewitz and his Works. Clausewitz.com. Accessed 2007-06-31. Clausewitz homepage, much information about him. 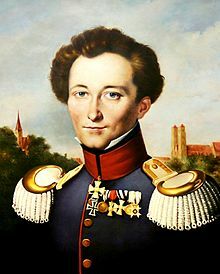 Wikimedia Commons has media related to Carl von Clausewitz. This page was last changed on 30 June 2018, at 15:25.